(6:30 p.m. EST) -- Westward, ho! American Cruise Lines -- the small-ship, U.S.-flagged cruise line that sails the Eastern seaboard of the United States -- has acquired Queen of the West and will be venturing into the Pacific Northwest for the first time next summer. In September, Blue Spruce LLC, a subsidiary of American Cruise Lines, announced the acquisition of Queen of the West from Majestic America Line. 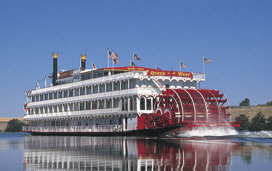 Now we've learned that the ship, a 120-passenger authentic paddlewheeler, will indeed sail for American Cruise Lines on seven-night itineraries on the Columbia and Snake Rivers, beginning in summer 2010. The sailings will depart from Portland, Oregon, and Clarkston, Washington and visit places like the Columbia River Gorge, Multonomah Falls, Mt. St. Helen's, The Dalles, Hells Canyon and Astoria. Before Queen of the West starts these new cruises, it will receive a refurbishment to add larger cabins and decrease the total passenger capacity for a more personal experience. Queen of the West last sailed for Majestic America Line in 2008, operating seven-night Columbia and Snake River cruises, roundtrip from Portland. Majestic America Line, which cruised along America's historic rivers and waterways on a fleet of stern and paddlewheelers, went bust at the end of that year. American Cruise Lines currently operates three ships on a variety of itineraries, ranging from New England down the East Coast to Florida. In addition to the acquired Queen of the West, a new ship, Independence, will join the fleet in 2010.